Sheffield United edged back into the top six with a fortunate point against draw specialists Birmingham City. Winless Blues - who have now drawn six of their eight Championship games this season - hit the frame of the goal in both halves. Lukas Jutkiewicz struck the post from 20 yards in the first half before Gary Gardner's free-kick from similar range came back off the upright with 10 minutes left. As well as owing a debt to the woodwork, United were also grateful to keeper Dean Henderson for denying Connor Mahoney late on as Blues somehow remained without a win. City boss Garry Monk will wonder how his side failed to break their duck, having fashioned the game's best chances and snuffed United out at the other end. Blues remain the Championship's joint-lowest scorers with just five goals so far but it was not for the want of trying at Bramall Lane. Their striking problems are not a new quandary - no Championship team scored fewer than Blues last season, although their strike rate did see an improvement after Monk's appointment in March. 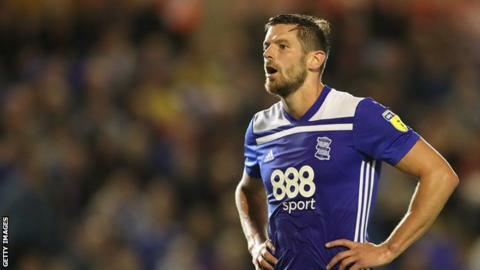 Jutkiewicz only netted six all season but he was unlucky to see his 20-yard strike hit the post, with Manchester United loan keeper Henderson possibly getting a slight - but crucial - touch. While goals seem to evade Blues at one end, they are watertight at the other, and they restricted the often free-scoring Blades to precious few chances. City keeper Lee Camp had only two saves of note to make - foiling Mark Duffy's deflected 30-yarder and making a key block early in the second half as George Baldock latched on to Oliver Norwood's sliderule pass. Blues cranked up the pressure late on but Omar Bogle's close-range overhead kick was too high and Henderson denied the clean-through Mahoney after being relieved to see Gardner's set-piece hit the post moments earlier. United, meanwhile, recorded a second successive blank after Saturday's defeat at Bristol City, but still climbed back into the play-off places despite their off-night. "They have done a job on us and we can feel a little fortunate to escape with a draw late on. But that was not from their shape or style, just our mistakes in getting sloppy towards the end of the game. "We've come away with a point. It was not the most free-flowing performance that we have produced in my time here but we quickly move on. "We are still in a great position. We are in sixth. It is a steady start for us and we have got another home game on Saturday [against Preston North End]." "In terms of the performance, it was the perfect away performance. We were very solid in the first half and then in the second half we stepped it up. "The second half especially, I was very, very pleased with. We were the most dangerous team on the pitch and we had clear-cut chances to win the game. "We are doing so much right - with a lot of the performances we have had, we know we deserve a hell of a lot more than we have got. "We want to give our fans that win and we have tried everything we can. That bit of luck, a couple of licks of paint and some good goalkeeping has stopped us winning again." Match ends, Sheffield United 0, Birmingham City 0. Second Half ends, Sheffield United 0, Birmingham City 0. Jack O'Connell (Sheffield United) is shown the yellow card for a bad foul. Foul by Jack O'Connell (Sheffield United). Foul by Ben Woodburn (Sheffield United). Substitution, Birmingham City. Wes Harding replaces Charlie Lakin. Corner, Birmingham City. Conceded by Dean Henderson. Attempt saved. Connor Mahoney (Birmingham City) left footed shot from the right side of the box is saved in the bottom left corner. Assisted by Jota. Corner, Sheffield United. Conceded by Harlee Dean. Attempt saved. Lukas Jutkiewicz (Birmingham City) left footed shot from the left side of the box is saved in the centre of the goal. Assisted by Jota. Gary Gardner (Birmingham City) hits the right post with a right footed shot from outside the box from a direct free kick. Attempt saved. Lukas Jutkiewicz (Birmingham City) header from the centre of the box is saved in the centre of the goal. Assisted by Jota with a cross. Attempt missed. Omar Bogle (Birmingham City) left footed shot from very close range is too high. Assisted by Lukas Jutkiewicz. Corner, Birmingham City. Conceded by John Fleck. Substitution, Sheffield United. Ben Woodburn replaces Mark Duffy. Delay in match Chris Basham (Sheffield United) because of an injury. Mark Duffy (Sheffield United) wins a free kick in the defensive half. Oliver Norwood (Sheffield United) wins a free kick on the right wing. Foul by George Baldock (Sheffield United). Substitution, Sheffield United. Billy Sharp replaces Leon Clarke. Charlie Lakin (Birmingham City) wins a free kick in the attacking half. Attempt saved. Che Adams (Birmingham City) header from the centre of the box is saved in the centre of the goal. Assisted by Maxime Colin.